You Asked For It, We Heard You! Our customers wanted a Selfie Stick and Tripod together. The FT-569 picks up where our Amazon's Choice FT-568 Selfie Stick leaves off. 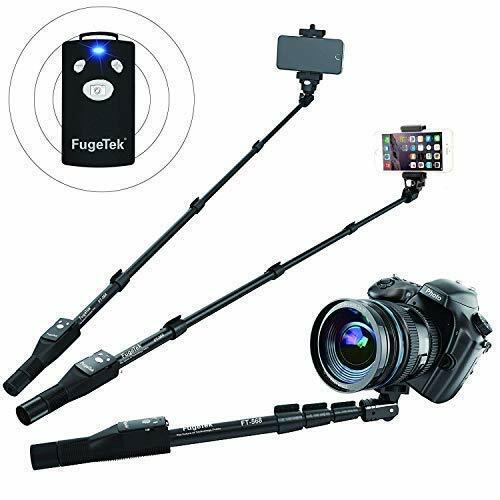 The Fugetek FT-569 Integrated, Portable, All In One Selfie Stick / Tripod is designed with FUN, FUNCTIONALITY and PERFORMANCE in mind. The highly adjustable and removable mount, guarantees you will have universal compatibility for your phone and other devices. Plus, a built in tripod base allows for more flexibility and variety of pictures. Why Our Professional Selfie Stick Surpasses The Competition... Products Features: * ALL-IN-ONE PROFESSIONAL SELFIE STICK & BUILT IN TRIPOD: No Need For A Separate Selfie Stick And Tripod. This fully adjustable all in one selfie stick enables a wide array of unique and spectacular photography options. * ULTRA EXTENDABLE AT 51", HARDLY TELL IT IS A SELFIE PICTURE! : Quick Flip Locks - No Twisting To Lock - Wobble Free Selfies - Toughest Material, Durable / Non-slip sure grip rubber handle. 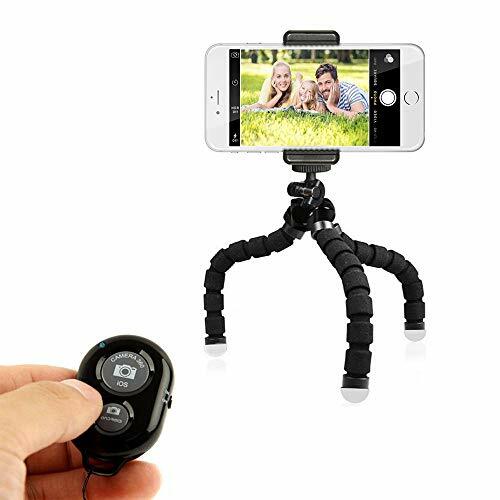 * FAST CONNECTING BLUETOOTH REMOTE: iPhone, Android, Digital Camera (Bluetooth may be incompatible with some cameras) - Compatible with iPhone iOS and Android 4.3 or newer (*iOS has no zoom feature. *Zoom works on limited Android devices, Bluetooth remote incompatible with Go Pro). Bluetooth Remote connects faster than the competition - Rechargeable Battery, 300 Hours Standby, 1 Hour Full Charge. * BUILT IN TRIPOD TO CAPTURE EVERY MOMENT: Extend The Feet On The Tripod And You Now Have A Standalone Selfie Stick. Equipped With Non- Skid Feet, For More Safety. Includes: 1 - Selfie Stick 1 - Bluetooth Remote 1 - Charging Cable 1 - Phone Mount 1 - Manual 1 - 1 year Warranty What are you waiting for? Try one out today. If you don't absolutely love it, send it back. You can always contact our friendly customer service staff in our Houston,Tx office. ALL-IN-ONE PROFESSIONAL SELFIE STICK & BUILT IN TRIPOD : No Need For A Separate Selfie Stick And Tripod. We Have You Covered With An All-In-One Professional Selfie Stick Tripod Combo. **REMOTE SHIPS IN HANDLE FACE DOWN, REMOTE IS NOT MISSING. FAST CONNECTING WIRELESS BLUETOOTH REMOTE : Use With Different Devices. iPhone, Android, Digital Camera (Bluetooth may be incompatible with some cameras) - Compatible with iPhone iOS and Android 4.3 or newer (*iOS has no zoom feature. *Zoom works on limited Android devices, Bluetooth remote incompatible with Go Pro). Bluetooth Remote connects faster than the competition - Rechargeable Battery, 300 Hours Standby, 1 Hour Full Charge. **REMOTE SHIPS IN HANDLE FACE DOWN. IT HAS 4 SCREWS. BUILT IN TRIPOD TO CAPTURE EVERY MOMENT : Extend The Feet On The Tripod And You Now Have A Standalone Selfie Stick. Equipped With Non- Skid Feet, For More Safety And Reliablity. Great For Lectures, Sporting Events, Presentations. ** Zoom Keys May Not Work With The Latest Google Pixel Phones. TWO AWESOME GIFTS IN ONE : What A Great Surprise To Get A High Quality Professional Selfie Stick And Tripod For The Same Price. Everyone can use it and will love it. Friendly Customer Service From Our Houston,Tx Office. 1 Year Hassle Free Warranty. 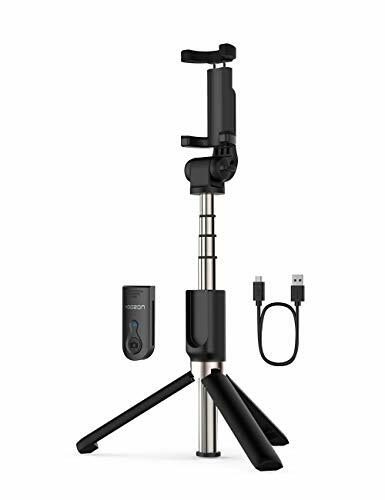 Selfie Stick Tripod With Wireless Remote 2 in 1 selfie stick tripod with built-in wireless remote "Xiong Tu" (max:33ft ), allows you to take selfie-photography or you could separate the controller to take group photos like parties, graduation, wedding, travel. You can use it as a regular selfie stick or as a quick and easy tripod. Extendable & Foldable Selfie Stick for Cell Phone This selfie stick tripod can be extended between 7.9 - 27 inches. which make it very suitable for Photograph, Facetime, Business and more. Compact design to take this selfie stick everywhere you go. ,make an ordinary Selfie Stick lighter but more functional. 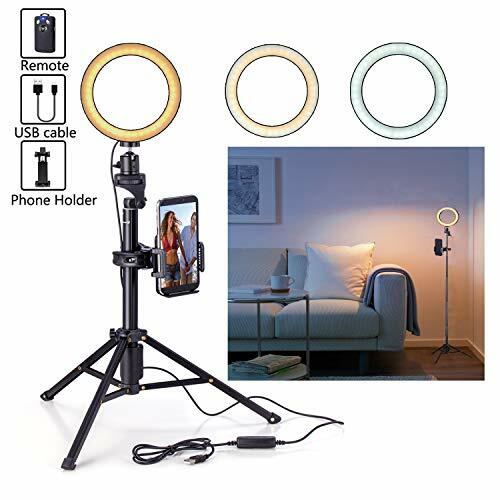 Adjustable Phone Holder Tripod and Selfie Stick 225 rotation head with an adjustable knob + 360 rotatable phone holder(support mobile phones up to 3.15 in wide), you could rotate and select horizontal or vertical camera mode to get the best angle photos. Simply twist the cradle head or phone holder to take photos, video call or live broadcasting. Widely Compatible Selfie Stick Tripods for iPhone Perfect Compatible with Most Smart Phone in Market, iPhone X/iPhone 8/8 Plus/iPhone 7/7 Plus/iPhone 6 Plus Android Samsung Galaxy S9/S9 Plus/S8/S8 Plus/S7/Note 8, Huawei and more smart cell phones. 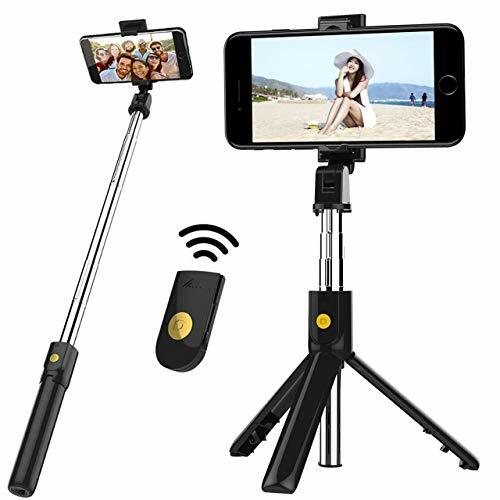 Lifetime Warranty and 24 Hours Customer Service Comfortable handle and metal material selfie stick tripod, not only light but also corrosion resistant and strong. Erligpowht Provide 30 days money back, 18 months warranty and lifetime customer service. Contact us freely if any issues, we will offer proper solution for you at the first time. - used on a table, around a pole, or even hanging from a tree branch, almost anytime that you can reach. Get The Perfect Angle - Adjustable OCTOPUS style legs help to capture clean shots from any angle even in the move. Want a view difficult to get with common tripod? This is your best choice! Control it from distance - The wireless remote serves a wireless range up to 30 ft. Ideal for taking individual, group photos & wide angle views. HATE IT WHEN CARRY A HEAVY SELFIE STICK? Yep, screwing a monopod selfie stick with a heavy tripod, is a pain. Our lightweight foldable selfie stick was designed to eliminate this to make a ordinary Selfie Stick lighter but more functional. HOW IS THE TRIPOD INTEGRATED AS ONE? Gently slide the WIRELESS REMOTE from stick (at the YOOZON logo part).It takes 3 seconds to make the TRIPOD appear just simply unfold the bottom part of the selfie stick. Ingenious design which makes the tripod open or close in one step. Fantastic way to start your selfie happiness. HOW DOES IT FIT VARIOUS OCCASIONS? Extendable length from 7.9 inches to 26.6 inches so you can choose your desired length.Compact pocket size design, which is easy to carry. With 360 rotation, you simply twist the cradle head or phone holder to take photos, video call or live broadcasting , to meet your different needs, or situation. CAN BLUETOOTH REMOTE BE RECHARGED? Yes. Just charge the BLUETOOTH remote shutter via micro USB. Built-in 65mAh lithium battery which makes the charge last longer. The range of the wireless connection can be up to 10 meters and widely compatible with most Apple/Android smart phones like iPhone 8/7/6 series, Samsung Galaxy series, etc. Just pull Mpow out from your pocket, then snap! This latest Bluetooth Self-portrait Monopod, Mpow iSnap X, features the one-piece design, no bother to install the product piece by piece. 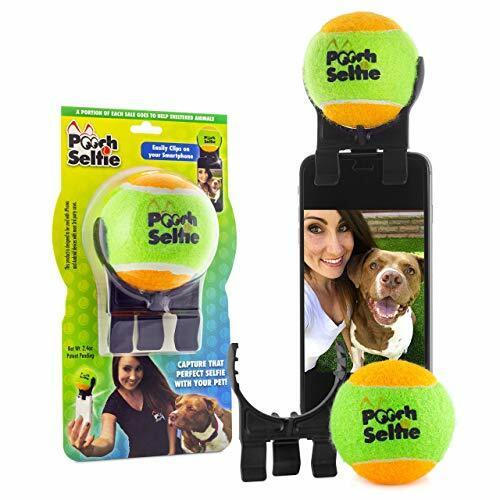 The most mini selfie stick in the market, pretty convenient and portable to be incorporated in your bags or even pocket! IOS/Android Compatible. Note: The selfie stick does not pair with Pixel 2/2 XL. It matches most IOS/Android phones, so you do not need to worry about the no connecting thing ! U-shape Clamp, Smaller and Tighter. The ingenious U-shape clamp design brings more advantages to users. First, U-shape clamp makes itself smaller ,does not take much space. Second, rotatable U-shape clamp can just roll over and let the stick in the U space ,which makes the stick look even more tiny and shorter. Another point is that the protective silicone material of the clamp enhance its surface friction, will help clamp your phones more tightly. One Short Click to Snap Your Picture. When you want to snap your picture, just click the camera button shortly and lightly, you will feel a strong feedback force, and this will brings a good using experience to you. The exquisite handlebar of the selfie stick gives you a perfect holding feeling due to its matte surface. When holding in hand, you feel soft in hard, while clingy as well, so the monopod won t fall off your hand. At MPOW, we back them all with an 18-month warranty & 45 days money back and provide friendly ,easy-to-reach support,and Free Lifetime Technical Support also. LIGHT AND COMPACT: The Most Mini and Comfortable Travel Size in 2019! Only 7.1 inches storing length, foldable & portable design suits for your pocket or bag perfectly. PREMIUM INSURANCE FOR YOU: The extra wrist strap can provide double insurance for the safety of your Mpow iSnap X and your phones. Note: The selfie stick does not pair with Pixel 2/2 XL. 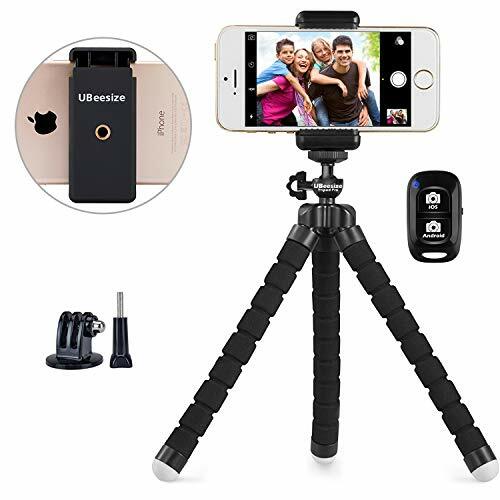 Durable and Secure: The updated tripod has a high quality metal ball joint and screw, longer and tightener pin along with improved legs and a upgraded phone holder. Multi-Angle Shots: 360 degree ball joint allows adjustment for multi-angle shots,and flexible tripod legs can get a level shot on an uneven surface, or wrap it on a pole, tree etc. to capture awesome shots. 1/4 Standard Screw for cameras: Detachable Holder can be unscrewed, then you can simply mount your camera to the screw for a secure hold. Compact Design:Its lightweight design and easy portability mean that you can put it in your pocket or your briefcase and take it everywhere you go. And you will be ready for the perfect picture at any time. [12-Month Warranty] Wide Compatibility: The phone holder's spring-loaded mechanism makes it easily retractable to adjusts to most phone sizes(width between 55mm - 85mm),including iPhone X/Xs/XR/Xs Max, 8/8 plus,7/7plus, 6s, iPhone 6s plus, iPhone 6 plus, iPhone 6, iphone SE/5s/5/5c, Galaxy s10s10 plus S8/S7/S6,Galaxy S7/S6 edge, Note 7/5/4/3 and so on. Easy to Install: There are two option to use the phone clip: 1. Screw directly to the tripod with pivoting arm, being able to 360 degrees to rotate. 2. Remove the clip from pivoting arm and then mount on a tripod. The swivel is also easy to change the Camera,Camcorder and smartphone's orientation (360 rotation) when taking pictures.Inner padding secure your device well and protect it from damage. 1/4 Standard Screw: Attachable to any regular sized tripod, monopod and smartphone with standard 1/4 screw thread at the bottom. Compact&Portable:Helps you shoot steady video for Facebook Live, Periscope, and other microphone live streaming Vlogging platforms Its light weight design and easy portability mean that you can put it in your pocket or your briefcase and take it everywhere you go. And you will be ready for the perfect Lens picture at any time. 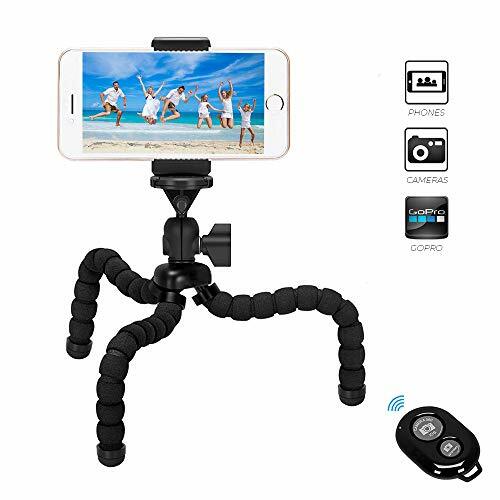 [12-Month Warranty]Retractable&Detachable Holder: Retractable Camera,Camcorder, phone holder fits most cellphones,Cameras,Camcorders and selfie sticks(width between 56mm - 105mm ),including iPhone X/Xs/XR/Xs Max,8/7/6/6s, iPhone 6/6s plus, iphone SE/5s/5/5c,Samsung Galaxy s10s10 plus S9/S9+,S8/S8+/S7/S6/S6 edge, Note 9 8 5 4 3 and so on. And it extremely easy to get adjusted to hold or release your phone. 60mAh rechargeable battery inside, charging time: 45~60 min, shooting time: about 20~25 hours, Compatible with smart phone(iOS & Android 4.3 and above),*iOS has no zoom feature. *Zoom works on limited Android devices, Wireless remote incompatible with GoPro .The LED light on the remote controller can indicate the status of the remote control. The flashing blue light means they are normally paired. Flashing red or non-flashing light indicates low battery. With 360 rotation, you simply twist the cradle head or phone holder to take photos, video call or live broadcasting , to meet your different needs, or situation. 7 sections telescoping stick with 98cm /38.5in max. usage length, allowing you to get wider shooting range. Compact size, about 200g weight and 20.5cmfolding length, fit into a pocket or hand. Foldable tripod legs with non-slip footpads for more stable photo taking and video recording. Selfie Stick Tripod : Built-in rechargeable Wireless Remote Control. The range of the wireless connection can be up to 10 meters. It can be perfectly Compatible with Most Smart Phone in Market, Such as IPhone x 8 6 7 Plus Android Samsung Galaxy S7 S8 Blackberry Huawei etc. 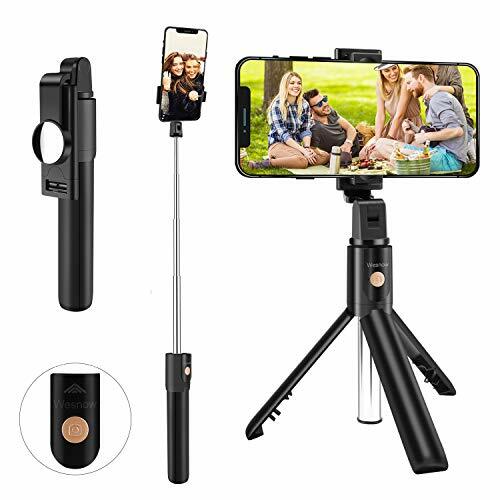 All-in-one Compact Design : 3 in 1 selfie stick with tripod, extendable selfie stick,8.07\'\' folded size&up to 39.8\'\' extension length, 7oz weight, fit into a pocket or hand. 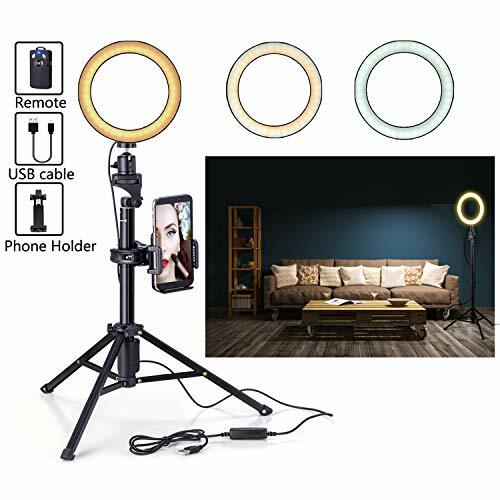 Adjustable Angle and Rotatable Phone Holder : 360 Rotatable Phone Holder and 180 Rotation Head allow you could take vertical and horizontal photos by simply rotating the angle, or take a picture of a wider vision. Composition is more diverse. 1-Year Warranty : Leypin offers you 1-year Warranty. If your selfie stick has any quality issues, please contact our customer service immediately. We will help you solve it as soon as possible. Compatible devices includes iOS/Android.Supports a variety of mainstream camera software. Intimate: Rearview mirror,Rotate 360 degrees around,capture the perfect shoot from various angles.Find the nost suitable photograpging angle for you. Light and Compact: Only 7.1inches(18cm) and 118g, foldable & portable design suits for your pocket or bag perfectly. Detailed: Fashion soft grip handle and Stainless steel extension rod. Wireless Bluetooth Connection: Just turn it on, pair it with smart phone via bluetooth and then snap. Using AA battery,easy to use and carry. 270 degree folding neck, size adjustable cradle, and extendable arm for full customization photo taking. Introducing the newest release, Stalion Selfy Stick! Enjoy our lightweight extended extra length adjustable grip holder monopod. Take unlimited selfies! Whether by yourself or with friends and family! Take Portraits or record video. Liven up your social media instantly! Stalion Selfy WIRED version is made of anti-rotating steel grooved tube with an extension ranging from 7.7-32.3 (20cm-82cm). Equipped with a thermoplastic gripping handle with camera shutter button. Enjoy 270 degree adjustable ball head at the end of stick for unlimited shot angles! The adjustable U-Clip will support any device weighing up to 17oz. with dimensions ranging from 2.1-3.15 (5.33 cm-8 cm) in length and 2.5-8 (6.35cm-20cm) in width. 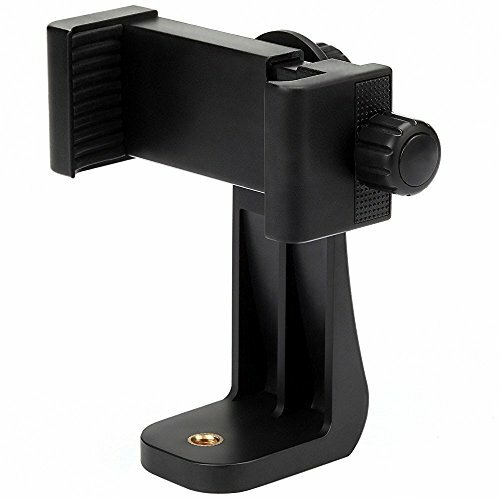 U-Clip is adjustable 270 degree rotating adjustability for multiple angle shots. 2 Independent rotating angles allow you to freely take unlimited pictures! Selfie Stick is Plug & Play battery free. Insert via your smartphones earphone/headphone jack. No charging required. Use anywhere anytime! Enjoy unlimited photography! Universal Fit for most smartphones, cellular phones, iPod Touch, and other camera wireless devices. Works with versions of iOS 4.0 and above, Android 3.0 and later versions. Package Contents: Selfie Stick with attached wrist strap (lanyard), Clip stander, U-Clip, User Manual. Covered under our Lifetime Warranty! Our Selfie Stick is designed with FUN, FUNCTIONALITY and PERFORMANCE in mind. The highly adjustable and removable mounts guarantee you will have universal compatibility for your phone and other devices. Note: Remote Ships Face Down In Handle From The Factory. It Is Not Missing. Same great design, more features and accessories for your money! 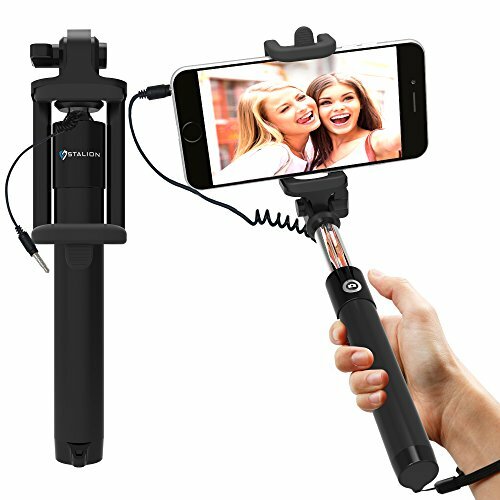 AFFORDABLE AWESOME GIFT IDEA > What A Great Surprise To Get a High Quality Professional Selfie Stick. Everyone of all ages can use it and will love it. ** Zoom Keys May Not Work With The Latest Google Pixel Phones. Enhanced Flexible and Durable Leg Upgraded with stronger material for peerless durability, adjustable rubber grip legs are perfect for outdoor in any position.The special Neo-rubber legs and Non-slip feet ensure a stable hold or uneven surface. Multi-Angle Shots Tripod Phone Stand 360 degree ball joint allows adjustment for multi-angle shots. Easy application and precise positioning with 360 panning, to expand the range of shots you can capture. Wireless Remote Shutter for photography The cell phone tripod equipped with remote control allows you to take pictures or videos away from the phone or the camera.The maximum distance is about 10m(30ft).Control it from distance,ideal for taking individual,group photos with wide angle views. Universal Compatible Phone Tripod The phone clip adjusts between 2.25-3.75 inches, works for iPhone 8/8 Plus/X/7 Plus/7/6s Plus/6s/6 Plus/6 & Samsung Galaxy S8/S8 Plus/S7/S7 Edge/S6/Note 7 or other smart-phones. By the standard 1/4 screw mount, you may easily attach it with digital cameras, Gopro. Tripod can be also used to iPad or tablet stand. 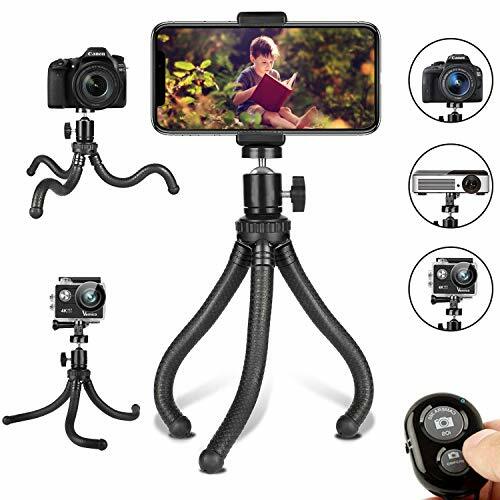 WHAT YOU GET 1x Flexible Mini Tripod; 1x Phone Grip Mount; 1x GoPro Adapter; 1x Wireless Remote Shutter; Erligpowht Provide 30 days money back, 18 months warranty and lifetime customer service. Contact us freely if any issues, we will offer proper solution for you at the first time. You can easily switch between Selfie Stick Mode & Tripod Stand Mode for your preferred use. An extendable body of 51 inches maximum length allows you to cram in more people or background to take the most satisfying selfies. The adjustable phone holder expands up to 3.54 in, fits most smart phones with or without a case, compatible with iPhone X/8 Plus/8/7 Plus/6S Plus/6S, Galaxy S9/S9 Plus/S8/S7 Edge/J7/Note 8/Note 9, Google Pixel & more Android Smartphones. Perfect for taking pictures and video from up to 30ft away. Compatible with iOS or Android smartphones (Android 4.2.2 or newer iOS 6 or newer). 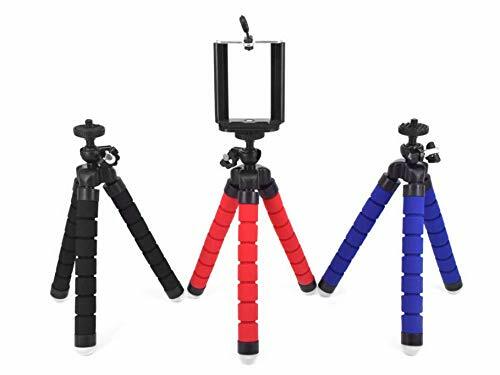 Selfie Stick Tripod Combo - Not only want to take the selfie, but also wanna take pictures/videos with excellent stability while liberating your hands? UBeesize has you covered with our all-in-one professional combo to take your filming to next level. Perfect for selfies, group photos, adventure travel, vlogging, YouTube videos, podcasts, Facebook Live, FaceTime, Instagram, livestreaming. Extra Long for More Possibility - Extendable from 17.5 inches to 51.0 inches (longer than average), combined with 180 neck rotation & 360 head rotation to find your best & beautiful shooting angle, you can now cram in more people or background to take the most satisfying selfies and capture awesome selfies or other photos from formerly impossible angles! Wireless Remote Shutter - The pocket-sized Bluetooth remote allows you to take selfies or group photos easily from a distance up to 30 feet. Compatible with most Apple/Android smart phones like iPhone 8/7/6 series, Samsung Galaxy series, etc. No app download necessary. Widely Compatible - Universal phone holder fits most smartphones with or without a case, compatible with iPhone X/8 Plus/8/7 Plus/7/6S Plus/6S, Galaxy S9/S9 Plus/Note 8/S8/S8 Plus/S7 Edge/J7, Google Pixel, Samsung, Huawei. With universal 1/4 inch screw, it fits for digital camera, DSLR, SLR, action camera, GoPro, webcam, camcorder. 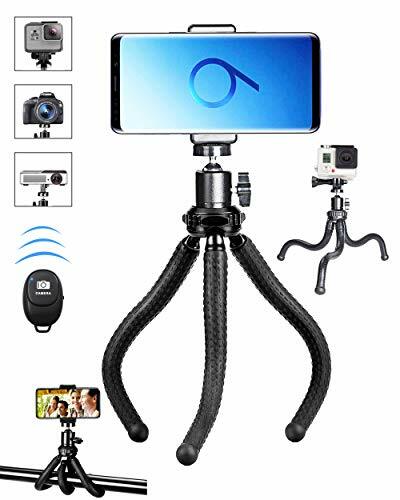 What You Get - 1x Tripod Selfie Stick; 1x Universal Phone Holder; 1x GoPro Adapter; 1x Bluetooth Remote Shutter; UBeesize 1 Year Hassle Free Warranty Warranty and 24-hour friendly customer service. Dimmable Ring Light 3 colors lighting mode: white, warm yellow, and warm white. Each lighting mode has 11 adjustable brightness to choose from, meet all your needs in different circumstances. The 5500K color temperature will remove any unflattering shadows from your face which is perfect for applying makeup, as well as for selfies, vlogs, or portrait photography. Wireless Remote Shutter Do not need apps, wireless connection, remote taking photos. (Furthest: 30 feet). Pocket size for Android and others system. 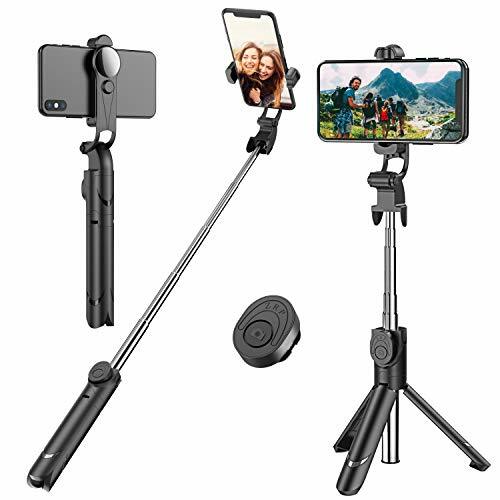 Extendable & Adjustable Selfie Stick Tripod The extendable tripod has 5-section tubes, Extendable from 13.77 inches to 54 inches, which makes it a possibility to be used as a folded table tripod or unfolded 54in tripod. Quick Release Cell Phone Holder Packaged with universal phone holder, very easy to use: The phone holder can be used with the stand or with a separate tripod or can be used on the bike and it can be rotated from landscape to portrait mode easily without having to remove the phone. It's compatible with most of smart phones, likeiPhone Xs/Max/XR 8/7 Plus /X/Android/iPod touch/Samsung/LG/Huawei/HTC,ect. 1-Year Warranty Eocean offers 1-year Guarantee. If the selfie ring with tripod has any quality issues, please contact our customer service we will help you solve the problem immediately. Universal phone mount adapter - The phone clip adjusts between 2.25-3.75 inches wide like iPhone xs max XR 8/8 Plus/x/7 Plus/7/6S Plus/6S/6 Plus/6 & Samsung S10 S9. By a standard inch adaptor screw thread, It is compatible with digital cameras like Nikon/Canon, DSLR, GoPro (GoPro adapters included). Selfie mode made possible - The new upgrade a wireless remote control allows you take shots (portrait and landscape) from a distance of up to 30 feet, Perfect for taking selfies, group photos, filming, vlogging and steady tripod shots. 360 Swivel Head The smartphone tripod provides a 360 shooting perspective. Capture the perfect shooting by adjusting the position of ball head. You can simply take horizontal or vertical photos by rotating the phone clamp and selecting the cellular mode.Max.load: 800g. 1-Year Warranty : BZE offers you 1-year Warranty. If your Flexible Tripod has any quality issues, please contact our customer service immediately. We will help you solve it as soon as possible. 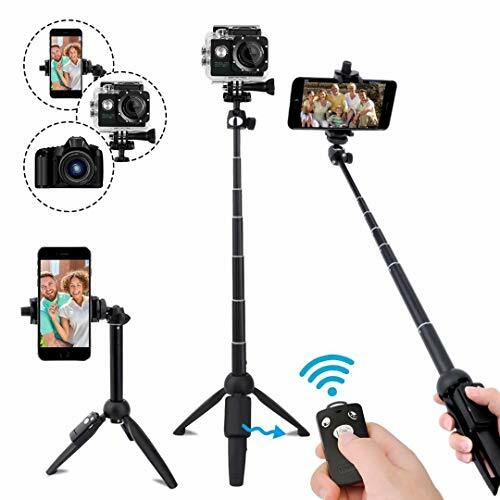 4 in 1 Wireless Selfie Stick Tripod Gore with Remote: 4 in 1 selfie stick tripod allows you to take a self-photograph, group photos or shoot memorable video easily and brings more joy into your life. It can help you capture the fun of the moment by camera or mobile phone. The remote is built into the stick, slide it out so you can stand away, control the wireless shutter to take photos or record videos. Prefect for party, traveling, graduation and so on. Record every meaningful moment in your life. Details: 1. 30m fully charge 2. 24h working time 3. 3-month standby time 4. 50000h lifespan Fits Camera & Smartphones We built the BS3 to fit almost every device with a 3. 5-6 inch smartphones or 1/4 screw port compact smart devices. Camera: Gore, most digital camera, sport camera, VR camera, DV, mini DLP Projector etc. iPhone: iPhone X/ 8/ 8 Plus/ 7/ 7 Plus, iPhone 6 / 6 Plus, iPhone 5 5S Samsung: Samsung Galaxy S8/ S7/ S7 edge, S6/ S6 edge/ S6 edge plus, S5/S4/S3, Galaxy Note 5/4, etc. Other: Sony Experian, LG, HTC, ONEPLUS, Huawei p9/p9 plus/p9 lite, Xiao Specifications: Product weight: 148g Maximum Length: 67. 9cm(include clamp max length: 8. 5cm ) Cradle Diameter: 5. 5cm-8. 5cm (Fits most 3. 5-6 inch smartphones) Cradle Rotation: 203-vertical, 360-horizontal Stutter control: Wireless Remote Battery Capacity: 65mAh(Li-polymer, Micro Port Charging) Dimensions: 4. 6cm*19. 55cm*2. 7cm Package includes: 1* BW-BS3 Sport Selfie Stick Tripod with 1* wireless remote 1* 1/4 Camera Mount Holder 1* Smart Phone Holder/Camera Mount Holder Fixed Screw 1* Micro USB Cable 1 * User manual(English, Germany, French, Italy, Spanish, Japanese) 1 * Card Please Attention: Windows system phones, Xiaomi 5X, Redman note 4, Samsung s5, Samsung s5 mini are couldn t connect with BS3-SPORTS. 65mAh LITHIUM BATTERY & NON-SLIP FPPD PAD & ALUMINUM ALLOY -- Internal 65mAh rechargeable lithium battery can capture up to 50000 selfies after full charge within 30 - 45 minutes, keep the remote working for 24 hours, last up to 3 months in standby mode. lifespan: 50000 hours. 1/4 universal screw head tightens the camera. 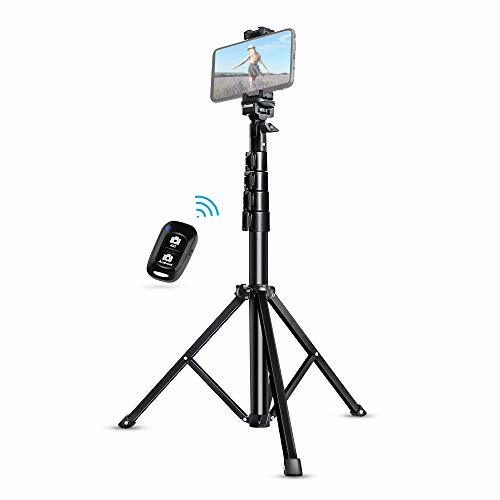 Aluminum alloy tripod with non-slip foot pad helps the tripod legs won't slide, so the tripod will be more stable to record video or face time with your family by the remote. 7. 8'' FOLDED SIZE & UP TO 26. 7'' EXTENSION LENGTH -- 5. 6oz weight, 7. 8'' folded size, convenient for you take it in your pocket or bag when travel; extendable length between 10. 8-26. 7'', use a short length for intimate shots, or make a longer length to get wider scenery. Blitz Wolf offers 18 months and the lifetime dedicated advisory to assure your long-term enjoyment. The unique design allows you to secure your compact digital camera and video camera. The unique locking mechanism gives you flexibility to safely place your camera on the tripod and remove it when necessary. Carry it everywhere and shoot perfect pictures and exciting videos that will last a life. Cameras interface: universal 1/4-20 screw. Enhanced Flexible Legs and Sturdy- With high density foam and premium plastic, Design of OCTOPUS legs can be twisted into any shape, wrap it on the tree, bike, lamp, chair. leg joints with rubberized ring and foot grips allow you to bend and rotate 360 for enhanced stability in difficult surface. A wireless remote control allows you take shots (portrait and landscape) from a distance of up to 30 feet, perfect for taking selfies, group photos, filming, vlogging and steady tripod shots. 12-MONTH WARRANTY AND 100% MONEY BACK OR REPLACEMENT We provide best quality wireless headset and best service for each buyer, 12 month warranty, 100% money back or replacement for any quality issue during warranty period. Life-time friendly service, answer and solve your problems within 24 hours. Switch the power button on"ON", the blue light flashes. That Indicates the Bluetooth is turned on. Search and match "AB Shutter" is paired successfully, the blue light will stop flashes. Switch the power button on"OFF" to turn off the Bluetooth. [COMPATIBILITY]: Works for smartphones up to 3.54" wide like iPhone 8/8 Plus/X/XR/XS/XS MAX/7 Plus/7/6s Plus/6s/6 Plus/6. By a standard inch adaptor screw thread, it is compatible with digital cameras like Nikon/Canon, DSLR, GoPro (GoPro adapters not Included). [LIGHTWEIGHT]: Compact and lightweight, this iphone tripod is perfect to throw in your bag,Easy to carry. [STYLE]: Update Quality phone tripod,New Design Phone Clips,Say no to flimsy, the OCTOPUS style legs stronger than older one. 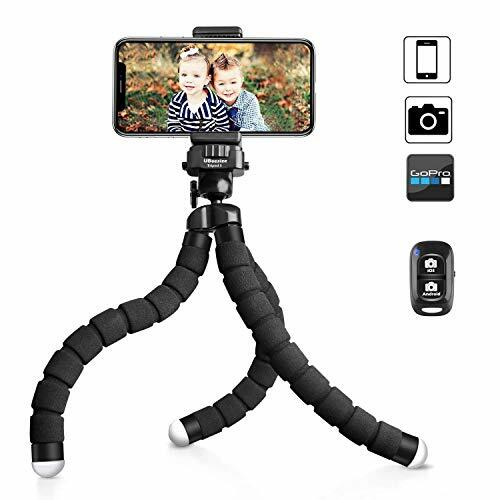 [FLEXIBLE & STURDY]: VIUME style tripod's legs are flexible and durable, that allows you can put your mobile phone or SLR camera in various angles while capturing special moments. Also can wrap it anywhere, such as tree limbs, doorknob, handlebar, rocks. Over two dozen leg joints with rubberized ring and foot grips allow you to bend and rotate 360 for enhanced stability in difficult terrain. [100% MONEY BACK GUARANTEE]: Offers a full 90 day 100% money back guarantee,FJMY Provide Unconditional Return if any Product Problem. Customer Experience as First. Please contact me whenever you have problem,We 100% Guarantee to Give You a Satisfactory Resolve Way. Yep, screwing a monopod selfie stick with a heavy tripod, is a pain. Our lightweight foldable selfie stick was designed to eliminate this to make a ordinary Selfie Stick lighter but more functional. 1.Press the remote control button until the blue indicator light. 2.Turn on Bluetooth, search for the new device "SelfieCom" and connect. 3.Open the mobile phone photo software after pairing and connecting. 4.Set poses and take photos according to the shutter control of the remote control. - The unique design allows you to secure your phone and camera. 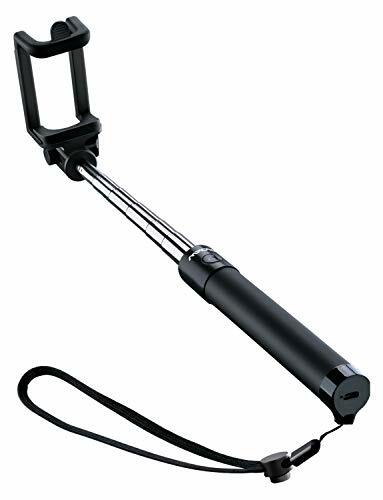 Comfortable handle and metal material selfie stick tripod, not only light but also corrosion resistant and strong. - Camera interface fits most cameras. Our customers come first. No quibble,10 months warranty which covers all our products. All-In-One Design: Selfie stick built in tripod. No need for a separate selfie stick and tripod. Extendable and foldable selfie stick for cell phone, light and compact design to take it everywhere. Universal Compatibility: Perfect compatible with most smart phone in market, iPhone X/iPhone 8/8 Plus/iPhone 7/7 Plus/iPhone 6 Plus Android Samsung Galaxy S9/S9 Plus/S8/S8 Plus/S7/Note 8, Huawei and more smart cell phones. Quality Assurance:It uses with high quality materials and has unparalleled durability and made of very strong durable foam and plastic. Full charge can continuous take over 5 thousand photos. Note: 10 minutes auto sleep. Control It from Distance: The wireless remote serves a wireless range up to 30 ft. Ideal for taking individual, group photos & wide angle views. And aluminum alloy tripod with non-slip foot pad that helps the tripod legs to keep it in place, hence giving you a more stable tripod while recording videos. Carry it everywhere and shoot perfect pictures and exciting videos that will last for life. Worry-Free Warranty:Within 10 months,if you have any questions about our products,please contact us in time. We will try our best to resolve all problems that you met. And we also strive to make customer have a happy shopping experience. 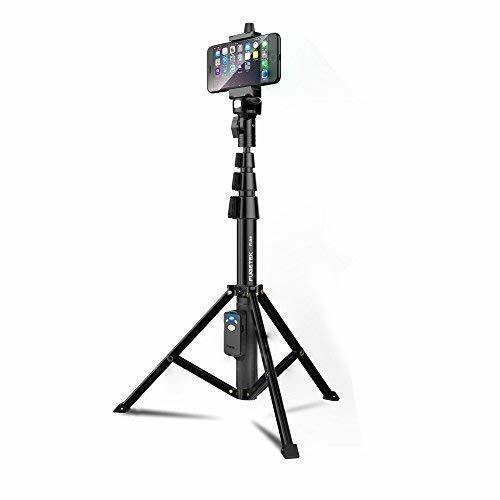 This JPS Exchange Cell Phone Tripod is perfect for anyone seeking to use their smartphone hands free. The durable and flexible design allows the user to prop up and stand their phone or camera virtually anywhere. The legs can be wrapped around any object so that you can take a photo or watch videos and movies from any surface. Wrap it around a pole, behind your car seat's headrest, on any surface, around a fence, anywhere! The tripod works with almost all smartphones and digital cameras. Almost any device you can think of fits within the parameters of this tripod. Multi Directional and Free Rotation Base. 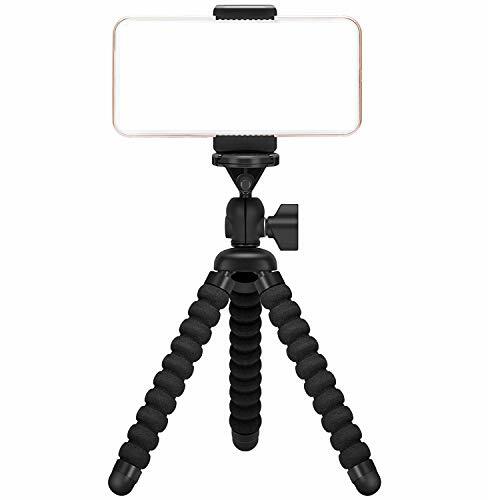 This cell phone tripod is perfect to use on any surface or pole. Fits IPhone, GoPro, Digital Cameras, Android, Samsung Cell Phones. The mount opens to various sizes and tightens to ensure a firm grasp on your device. Grasps seamlessly to any device up to 3.75 inches. Sturdy Base and Wrap-Around Functionality- Perfect for Selfies and Group Photos. Use as a selfie stick or for taking videos and photos anywhere! 1.Turn on Bluetooth remote,press the Bluetooth remote button for a few seconds,Bluetooth indicator light will start flashing. 2.Turn on your phone Bluetooth,pairing with the name is 'selfiecom'. 3.Put your phone in the phone holder,click the Bluetooth remote for photography. Notice: Product specification is printed on the outer packaging,please do not throw it away. 1.Bluetooth wireless remote- can be pick off and remote control,free your hand. 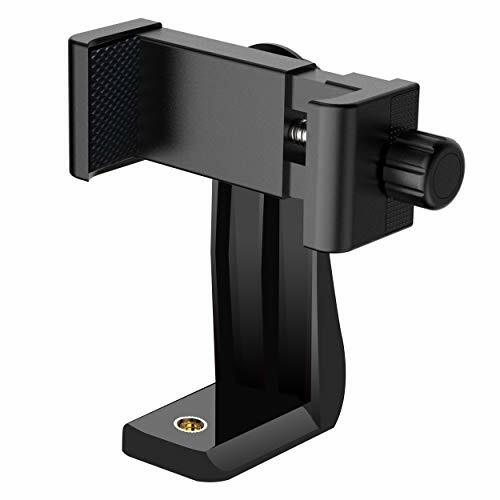 2.Rotating mount holder- adjust any angle you want. 3.Extendable stick- extend any length you want. 4.Accessary mirror- accessary little mirror to check your appearance for looking better before photograph . 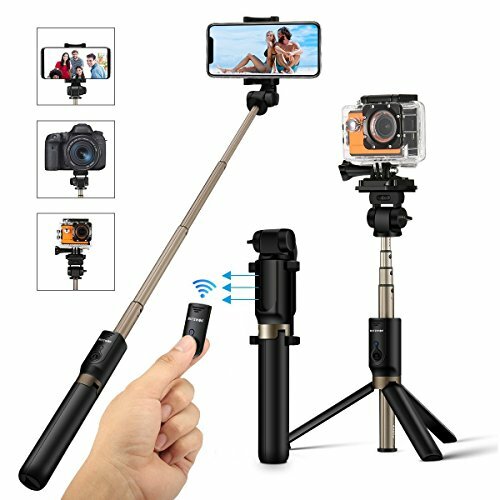 Bluetooth Monopod and Tripod in One Selfie Stick Bluetooth selfie stick combined with monopod and tripod,monopod and tripod mode conversion function allow you meet different personal needs.Built-in detachable Bluetooth wireless remote is compatible with most of smart phones,which includes IOS or Android phones. Portable Size with Accessary Rearview Mirror Selfie stick weighs just 5.7oz ,lightweight foldable selfie stick tripod is storable and portable so that you can conveniently bring it everywhere.And it has a little rearview mirror on the back of rotatable phone holder,which can help you check your looks when in rear camera mode. Adjustable and Extendable design Phone mount with adjustable and rotable design,adjustable phone clamp allow you stretch the clamp to fit for your phone,and 360 rotatable phone clamp and 270 rotatable phone mount help you to get any angle you want.Extendable selfie stick can be extended from 7.64 inches to 27.6 inches,this will satisfy your requirements for different height. Long Battery Life The Bluetooth remote control in selfie stick uses replaceable battery CR1632 ,this is designed to enable you to use selfie stick without outlet in outdoor, just go to the shop you can buy this battery when the battery drain. Product Warranty We devote ourselves to serving the needs of customers if you have any questions or suggestions about selfie stick please feel free to contact us and we will reply to you as soon as possible.